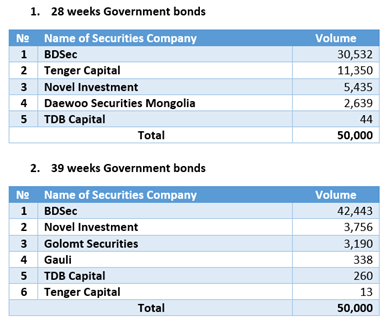 October 11 (MSE) On 11 October 2016, 28 weeks Government bonds /16.864% annual coupon rate/ worth MNT5.0 billion, 39 weeks Government bonds /16.930% annual coupon rate/ worth MNT5.0 billion traded respectively at Mongolian Stock Exchange. October 11 (MSE) According to the enforcement letter No. : 132 from state inspector of Financial Regulatory Commission dated on 11 October 2016, the trading license of "Silicat" JSC reinstated. October 11 (MSE) The shareholders meeting of "Baganuur" JSC were announced by the Clause No. 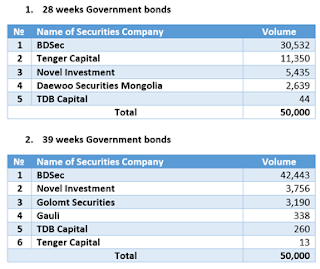 : 61.2, 61.4, 61.7 of Company Law of Mongolia and the Resolution of Shareholders meeting dated on 04 October 2016. 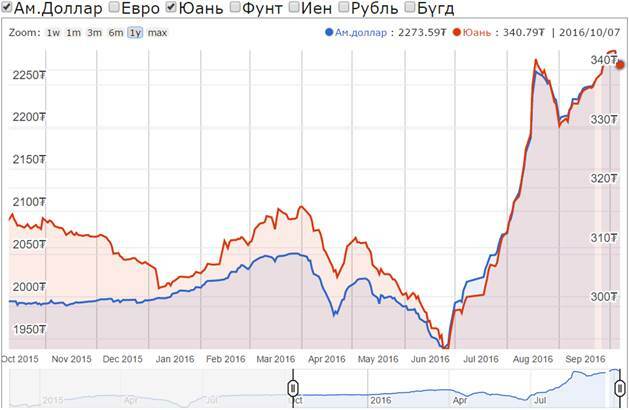 October 11 (Bank of Mongolia) Spot trade: Commercial banks bid MNT 2265.00-2276.51 for USD17.7 million and MNT 337.00-339.25 for CNY26.6 million respectively. The BoM did not accept any bid offers. 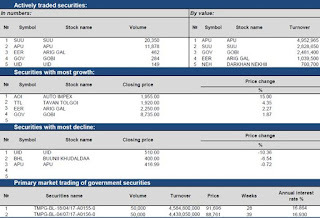 Swap and forward trade: The BoM received bid offers of USD11.5 million of MNT swap agreements from commercial banks and the BoM did not accept any bid offers. 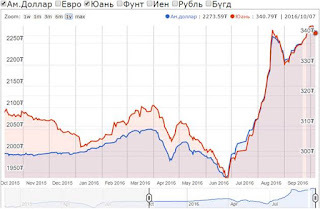 October 12 (Bloomberg) -- Mongolia exported 16.3m tons of coal in Jan.-Sept., compared with 10.5m tons in the same period a year earlier, for a 55% increase, the National Statistics Office says on its website. 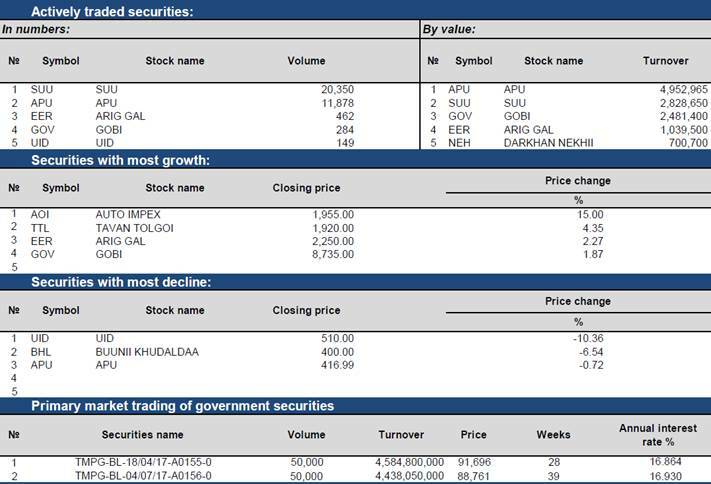 October 12 (Bloomberg) -- Mongolia's total revenue and grants to the general govt budget in January-September were 4.01t tugrik compared with total expenditure and net lending of 6.06t tugrik, for a budget deficit of 2.05t tugrik ($905.4m), according to a release by the National Statistics Office. Ulaanbaatar, October 11 (MONTSAME) This autumn's parliament session is taking a break to resume after the elections of the citizens' representatives khurals in districts of Ulaanbaatar and localities. Although the State Great Khural is discussing the government budget draft, such a decision was made due to insufficient quorum for most lawmakers are in rural areas for local election campaigns, the source says. October 11 (UB Post) Prime Minister J.Erdenebat met with residents of Khuvsgul Province on October 7, in Khuvsgul Province. It was J.Erdenebat's seventh province visit since being appointed Prime Minister. Minister of Labor and Social Protection N.Nomtoibayar, Minister of Energy P.Gankhuu, Minister of Education, Culture, and Science Yo.Otgonbayar also met with representatives of Khuvsgul Province to discuss local issues. The Prime Minister told Khuvsgul Province residents that his government's 2016 to 2020 action plan is designed to overcome economic difficulties and to move forward on mega projects across the country. He also spoke about the government implementing the Nasnii Khishig program for senior citizens, granting loans to students, and granting government scholarships to one student from a household with more than three children enrolled in higher education. He emphasized that the policy of the government must be clear, and that he has instructed his Cabinet ministers and Members of Parliament to support the opening of three to five new factories across the country. Province residents reminded the Prime Minister that Lake Khuvsgul contains 0.4 percent of all the freshwater in the world, and that the lake should be protected by inclusion in international environmental projects and programs. Representatives of Khuvsgul Province told the Prime Minster that the school in Chandmani-Undur soum has mold, and it is affecting the students and teachers. They also said that the province's central hospital cannot provide medical services to all the residents of Khuvsgul Province. The Prime Minister promised to resolve the issues raised by residents and to build a new school building. October 11 (UB Post) The national economies of both Mongolia and Poland were at the same level in Soviet times. After Poland joined the European Union in 2004, its economy grew. Are there similarities between the mining industries of Poland and Mongolia, and what can we learn from them? How did Poland recover from Dutch disease? Dutch disease is a phenomenon that affects countries that have plentiful oil, natural gas, or valuable mineral resources. It can have a big impact on a country with a small economy. Nigeria and South Africa, both with commodity intensive revenues, are considered to be representative of Dutch disease in some circles, and their economies are skewed toward supporting only specific sectors. It is suddenly realized that if market forces move against a specific industry in terms of revenues, there are no other profitable sectors that an economy can fall back on. Diversification is key. After 1970, the Polish economy experienced symptoms of Dutch disease. In the 1960s and 1970s, the communist leadership managed vast resources for the development of Poland and its already established coal mining sector. Together with a newly emerging sulphur and copper mining sector, large deposits were found. Investment was not exclusively related to mines, but also included harbors, technical universities, and heavy machinery manufacturing facilities. 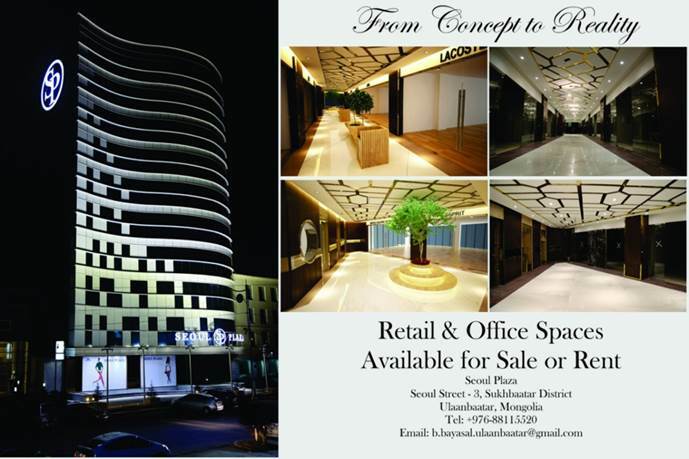 Development efforts were focused on being able to export resources to Western countries that were paying in USD. During that time, the exchange rate was two to four times higher than it is today. The result of this focused effort was that all other sectors of the economy were underdeveloped and underfinanced, and they lost their international competitive edge. The mining sector peaked and produced a record output for a number of years, after which a political transformation, the exchange rate dropped, and mining output plunged. After the 1980s, the situation started to become more balanced, as free market forces started to take over in the post-communist democracy. The key to avoiding Dutch disease in Poland was that there was a gradual increase in production, investment levels were controlled, and steep peaks in output were avoided, all while maintaining consistent and predictable regulatory oversight. In contrast, the Mongolian mining industry is poor compared to Poland's. Mongolia experienced the Dutch disease as the development of the mining sector in 1977 was relatively big for a country with a very small economy, and it has always been reliant on trade with its neighboring countries. According to World Bank statistics, Mongolia reached over 14 billion USD in foreign direct investment (FDI) from 1990 to 2013. The mining sector of Mongolia was considered a profitable sector, and foreign trade affected both the mining and agricultural sectors. The exchange rate for Mongolian currency against the U.S. dollar declined from 2008 to 2011. The growth in export of minerals and FDI affected the export of agricultural products. Mongolia holds huge mineral resource capital estimated to be worth one to three trillion USD, with gold, coal, and copper being the nation's principal reserves. Mongolia is home to 10 percent of the world's known coal reserves. The Tavan Tolgoi coal mine is one of the world's largest coking and thermal coal deposits. The Mongolian government established a joint venture with Turquoise Hill Resources ( majority owned by Rio Tinto) to develop the Oyu Tolgoi copper and gold deposit in 2009. Oyu Tolgoi is the biggest foreign invested project in Mongolia, and it involved more than six billion USD (50 percent of GDP) in FDI for its first phase of development. Another five billion USD is in the pipeline for the second phase. Oyu Tolgoi began exploiting the deposit using open pit mining. Construction was completed and commercial production began in 2013. However, the second phase, which will exploit the deposit through underground mining, appears crucial to recovering the cost of the project. Cost recovery has been stalled by disputes between the Mongolian government and Rio Tinto. Mongolia needs to increase its GDP in order to encourage the FDI which influences the mining sector and implement laws to protect investors. October 11 (UB Post) The second Listen to Us conference will be held at Tanan Center in Ulaanbaatar, on October 14, to advocate for and protect the rights of women and children as part of the UN's International Day of the Girl Child, annually observed on October 11. Observance of the first International Day of the Girl Child was declared by the United Nations on October 11, 2012. This day is a reminder of the need to eliminate the inequality faced by girls worldwide based on their gender, such as the right and access to education, nutrition, legal rights, and medical care, and protection from discrimination, violence, and forced marriage. The theme for this year's International Day of the Girl Child is "Girls' Progress = Goals' Progress: A Global Girl Data Movement", which focuses on adolescent girls and the 2030 Sustainable Development Goals. Joining the global effort to ensure a world free of discrimination for young women and girls, Gunj Center for Women and Girls partnered with three Mongolian NGOs that strive to protect the rights of children and hosted the first Listen to Us conference in 2014. Nearly 150 people participated in the first conference, engaging in discussions on challenges and violations to the rights of girls in family environments, school environments, and the public arena. This year's conference will be a platform for women and girls to freely voice their opinions, discuss gender-based violence and the challenges they face every day, raise public awareness about gender inequality and challenges, and identify and track progress towards solutions to their most pressing problems. October 11 (gogo.mn) Government of Mongolia in cooperation with the International Development Association, a member of the World Bank Group, have agreed to implement a project to support export and submitted it to the State Great Khural. The project which will be implemented for five years, will support the production of national enterprises directed towards export. The loan amount will be US$ 20 million with an annual interest rate of 1.25% and 25-year term. October 11 (news.mn) J.Erdenebat, Prime Minister of Mongolia will make an official visit to Japan from 12th to 15th of October. He will have meetings with Shinzo Abe, Prime Minister of Japan, during which they will sign various agreements. The two prime ministers will also discuss modifications to the bi-lateral "Strategic Partnership". During the visit in Tokyo, J.Erdenebat will make presentation about the Mongolian economy and investment climate as well as on forms of cooperation at the 'Japan and Mongolian trade and investment forum'. It will be recalled that on July 14, the Prime Minister of Japan Shinzo Abe visited Ulaanbaatar on an official visit and to attend the 11th ASEM Summit. October 11 (IFRC) Thousands of nomadic herder families lost their only livelihood after extreme winter conditions, or dzud, struck Mongolia last year and decimated their livestock. The disaster has also caused anxiety and fear among children, as concerns about the risk of violence, poverty and migration triggered stress within the affected herder families. "After the training, the volunteers returned to their communities to train teachers and youth peer educators on psychosocial support," said Oyu Baatar, the Mongolian Red Cross Social Care Programme Manager. "These communities are located in isolated and hard to reach areas, where the Red Cross is sometimes the only organization able to provide consistent humanitarian services." "The homeless children in the district of Bayanzurkh often come from violent or otherwise dysfunctional families," said Chimgee, a Red Cross volunteer. "They always end up on the streets after running away from home." These children will be referred to the government child protection centre, which houses them for one month while their needs are assessed. "It is important for the Red Cross to be available for these children, as they are one of the most vulnerable groups, particularly when they are out there on the streets," said Chimgee. "They have no one else." The Red Cross will begin a pilot project on violence prevention with the communities in Bayanzurkh. The project uses the IFRC global Community Based Health and First Aid Programme module on violence prevention and response. The project will focus on training volunteers and partnering with local police, the government's child and family development unit, schools and non-governmental agencies to discuss solutions to violence. "We need to see that children are our future," said Khuslen, a Mongolian Red Cross Youth volunteer. "Adults should model safe behaviours for children because children are the most at risk of violence. When youth and adults work together, we can do so much more to stop different forms of violence in homes and schools." October 11 (UB Post) Syria is one of the hottest places on earth, as well as the epicenter of the turmoil ripping through the Middle East. Five years and seven months has elapsed since the outbreak of the ongoing Syrian civil war. Millions of children have been left war-weary from the tortures of losing one's parents, siblings and dearest friends. The Syrian conflict is taking place far from Mongolia and might seem difficult and frightening for Mongolians to personally involve oneself in the chaos, but Syrians need every aid they can get. During this difficult time, executive director of Ard Financial Group Ch.Gankhuyag and his spouse G.Uyanga initiated the Giving Nation campaign to offer a helping hand to Syrian children suffering amongst the catastrophic conflict between the Syrian government, a loose alliance of Syrian Arab rebel groups, the Syrian Democratic Forces, Salafi jihadist groups, and the Islamic State of Iraq and the Levant. Giving Nation campaign's initiator G.Uyanga gave an interview about the campaign. Below is the translation of the interview. Your family initiated the Giving Nation charity campaign to help Syria's war-affected children. How is the campaign work progressing? It hasn't been long since we started working on this initiative. We have just formed a working group and started working on the first stage of the campaign. Many companies have expressed to join our cause and have shown support to the campaign. Right now, we're promoting and disseminating information about the campaign to the public through the media. Anyone can get access to the relevant information by visiting the Giving Nation Facebook page. We plan to continue the campaign until the last week of October, and then, we will send donations to Syrian children. Why did you start the Giving Nation charity campaign? Undeniably, Syria has become the most painful and frightening part of the world for everyone. We live on the same planet. I believe that the Syrian conflict concerns us all – it shouldn't be ignored. Things that are happening on earth matters to everyone living on it. The Syrian civil war is the largest war ongoing right now and the warzone is a terrible place where the rights of millions of men, women and children are being violated. Mongolian children will grow up to become world citizens in the future. Therefore, it's important for them to be aware of global events, be engaged in global matters, participate in making decisions and finding solutions for global issues, and develop themselves, as well as their understanding of global matters. Everything is occurring on the same planet that we share, not in some remote planet. On the other hand, our ancestors used to stretch out a helping hand to other nations. For instance, Mongolians offered everything they had to assist and aid Russians during World War II. At the time, our nation wasn't an affluent country. Mongolia wasn't exactly in a situation that could aid another country. From what I heard and read, the living condition in Mongolia was much worse back then than it is now. During World War II, Mongolia had barely overcome its own share of war chaos. The statue of a Mongolian horse in Moscow is a symbol of valor and a tribute to our ancestors who helped during World War II. Their bravery and contribution is engraved in the hearts of many Russians and reminisced about every now and then. 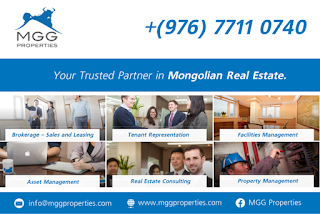 Mongolians aren't people who constantly seek aid from others, receive from others, or chase after investment. 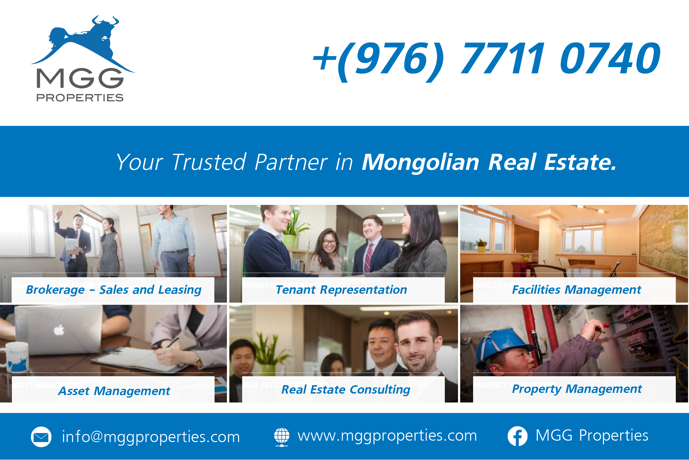 In fact, Mongolians are people who give anything within their power and are well-aware that they are world citizens and part of this world. I'm sure that this nature of ours will be well portrayed through the Giving Nation charity campaign. There are some who are critical of your campaign. They are questioning why they should help Syrian children when there's countless vulnerable children living in Mongolia. Why did you choose to help Syrian children in particular? Do Genghis Khan and Westerners have a common ancestor? October 11 (The Hankyoreh) Based on a DNA analysis of bones that likely belonged to the Mongolian royal family, South Korean researchers have concluded that Genghis Khan and Westerners might share a common ancestor. "After analyzing the DNA from five bodies discovered in Mongolia in 2004, we concluded that they were members of Genghis Khan's imperial family from the Mongolian era in the 12th and 13th centuries. We also concluded that these individuals' patrilineal origins could be the same as the ancestors of Westerners," said Lee Kwang-ho, the leader of the research team, on Oct. 10. Lee is a professor in the departments of life science and science of cultural heritage at Chung-Ang University. The Korean researchers prepared the paper in collaboration with a team led by Dashtseveg Tumen, a professor of anthropology at the National University of Mongolia. The paper was published in the Sep. 14 issue of "Plos One," an open access journal. The bodies (three male, two female) were unearthed in 2004 in Tavan Tolgoi in eastern Mongolia, which is 650 km from Mongolia's capital of Ulaanbaatar. One of the female bodies was nicknamed the "Mongol queen" because the shape of the tomb, its layout and the burial goods found there suggested that she might have been part of the imperial family. After analyzing the bodies using the carbon dating method, the researchers found that they very likely belonged to the family of Genghis Khan (that is, the imperial family) around the time that he was alive. An analysis of mitochondrial DNA also showed that the three males and one of the females had the same genotype, indicating they had the same matrilineal origins. This suggests that they may have been four siblings or a mother and three sons. The bodies' mitochondrial genotype was the haplogroup D4 (showing that they had the same maternal lineage), which is typically observed in Northeast Asian populations today. A Y-SNP (single-nucleotide polymorphism on the Y chromosome) analysis of the three males found that they all had the Y-haplogroup R1b-M343, which has the broadest distribution in the UK and other parts of Europe. "This shows that the patrilineal origins of Genghis Khan's family may not be Mongoloid, as is generally believed, but Caucasoid," Lee said. In other words, this genotype analysis raises the possibility that Genghis Khan's paternal ancestors were the same as Westerners'. The genotype that was detected in an STR (short tandem repeat on the Y-chromosome) analysis of the three males is the same as that found in Russian Kalmyks, Han Chinese, Uzbeks and Tajiks today. These regions were ruled by Genghis Khan, his sons and his grandsons. Ulaanbaatar, October 11 (MONTSAME) A protocol has been signed on feasibility study for the Project on Conservation of Endangered Mazaalai Species of Mongolia. A proposal on implementation of such a project was forwarded by the government of Mongolia to the Chinese side. Nine specialists from China conducted a research on ways of improving the living environment for Mazaalai between September 28 and October 10 at the Great Gobi Strictly Protected Area. The research will help set the starting point for the feasibility study. The project will greatly contribute to saving the species of Gobi Bear, which has a population of only 28, said the Vice Minister of Environment and Tourism Ts.Batbayar. The Mazaalai was inscribed in the List of Endangered Species in 2010. Minister Counsellor at the Embassy of the People's Republic of China, Mr Yang Qingdong said: "Mazaalai is a precious treasure of Mongolia. Therefore, it is crucial to save these animals. However, the works face serious problems regarding the natural habitat of the species. The Embassy will put all efforts in realizing this project". Director of the Environmental and Natural Resource Management Department of the Ministry D.Davaasamba and the Secretary of Trade and Economic Affairs of the Chinese Embassy Liu Jiefen signed the protocol. October 10 (UB Post) On October 8, the Ulaanbaatar City Council received Mongolian Olympic and Paralympic medalists and presented them the biggest prize of Ulaanbaatar, the Order of Khangarid. Chairman of the Ulaanbaatar City Council Ts.Sandui and Mayor of Ulaanbaatar S.Batbold handed the Order of Khangarid to Olympic bronze medalist D.Otgondalai, and Paralympic bronze medalists B.Uugankhuu and E.Sodnompiljee. Mongolia won silver and bronze medals at the Rio 2016 Summer Olympics and two bronze medals at the Rio 2016 Paralympics. Chairman of the Ulaanbaatar City Council Ts.Sandui said, "The Order of Khangarid is presented to people who made the biggest achievements of the year. Athletes who won medals at the Beijing 2008 and London 2013 Summer Olympics were awarded the Order of Khangarid. Now it's your turn to be awarded the Order of Khangarid." International Sports Master D.Otgondalai said, "I was awarded the Medal of Honor of Ulaanbaatar after claiming victory at the Incheon 2014 Asian Games. I am happy that I'm being awarded the Order of Khangarid today." Judoka B.Uugankhuu said, "I want to thank the Ulaanbaatar authorities. Support from the state is very important to the athletes." October 11 (gogo.mn) The 8th Ulaanbaatar International Film Festival (UBIFF) will bring the wonderful world of art cinema to the Mongolian capital. From October 11 to 14th, UBIFF will present an exclusive program of the best of the best from the international scene, including award-winners from Cannes, Berlin and Toronto International Film Festivals and nine other critically acclaimed films from, among other places, Afghanistan, France, Germany, Korea, Poland, Taiwan and the United Kingdom. As a result of the huge public success of the previous seven annual festivals, the Arts Council of Mongolia is working with the Embassy of France and Embassy of the Republic of Korea, Geothe-Institute and Taipei Trade and Economic Representative Office in Ulaanbaatar to continue to introduce local audiences to a range of the most recent and cinematically daring, uncompromising and powerful filmmaking from around the globe. On October 11, UBIFF will kick off with the screening of a Mongolian, Polish, and German joint film 'Zud', directed by Marta Minorowicz, at 7 PM at Tengis Cinema and on October 12 at 7 PM at iCinema. This year, we will celebrate Korean Cultural Days. So naturally, Korea has been chosen as the festival focus country. UBIFF, in collaboration with the Korean Embassy in Ulaanbaatar will showcase three prominent Korean films on October 12 at Tengis Cinema. On October 13 and 14, international films from other countries will be screened. To present a quality international program, this year we brought the most recently-produced and award winning films from international film festivals. Most of them were selected at the 2016 Cannes International Film Festival. For example, Sólveig Anspach's film 'Together project' screened at the Directors' Fortnight section at the 2016 Cannes Film Festival, 'The Salesman' by Asghar Farhadi was selected to compete for the Palme d'Or at the 2016 Cannes Film Festival. This year UBIFF's highlight film 'I, Daniel Black' by director Ken Loach won Palme d'Or at the 2016 Cannes film festival. Also a Wolf and Sheep film directed by Shahrbanoo Sadat, which is an Afghanistan film was developed with the Cannes Cinefondation Residency in 2010 and will screen on October 13. An Assassin film directed by HOU Hsiao-Hsien, a Taiwan film director who was awarded best director of the Cannes film festival and 'Barbara' film directed by Christian Petzold will be presented. It was awarded at the Berlin International Film Festival and will screen on October 14 at Tengis Cinema. We have no doubt that French film critic Thibaut Braq, who has been working as an international programmer for the 4th year will bring films that appeal to a broad audience of film enthusiasts and enrich the festival's content. October 11 (gogo.mn) Concerts of the best five Jazz musicians and singers will be held as series for the first time in the history of Mongolian art. In scope of "Ulaanbaatar International Jazz series 2016-2017", initiated by the JazzLab agency, famous Jazz singer Kenny Washington from USA, singer and pianist Champion Fulton, best musicians of Italy Ignasi Terraza, harmonican Laurent Maur from France, saxophonist and world star Jessie Davis will arrive in Mongolia to perform for the concets. Jazz singer Kenny Washington from USA will stage the first concert named "The Voice of Jazz" on Oct 20-21 at the Mongolian State Academic Theatre of Opera and Ballet. Pianist Paul Kirby from Scotland, contrabass player Martin Zenker from Germany, drummer Min Chan Kim from South Korea are invited to the concert. Even JazzLab agency, aims to support Mongolian jazz musicians, invite best jazza artists in Mongolia to perform concert and support jazz music education, has newly established, they have successfully organized over 60 concerts in Mongolia. Organizers are expecting that the "Ulaanbaatar International Jazz series 2016-2017" will take Mongolia culture to the next level. Ulaanbaatar, October 11 (MONTSAME) The Russian travelling circus "Moskovskii Delfinarii" will debut its first ever in Mongolia performance - the sea-world shows on Wednesday at the National Amusement Park of Ulaanbaatar. Dolphins and seals will entertain the Mongolian audience. The show will start at 18.00 on working days and at 12.00, 15.00 and 18.00 on weekends. The tickets are sold with ranging price between MNT 15,000 and 30,000 at the Amusement Park Cashier. Ulaanbaatar, October 11 (MONTSAME) The Mongolian film "White Khadak", directed by J.Sengedorj, is bringing the national audience on the edge of their seats. The film, being screened in seven cinemas throughout Ulaanbaatar, is leading the market with largest number of spectators. The White Khadak is followed by the "Itgel" (Trust), which has been premiered just recently, the "Galzuu Zugaalga" (A Crazy Picnic) and the "Odod Bolohyn Huslen" (Desire to become stars). From international films, Tim Burton's the Miss Peregrine's Home for Peculiar Children and Mark Wahlberg's Deepwater Horizon films are the most watched by Mongolian audience in theatres. October 11 (UB Post) Throat singing is who I am because since my birth, my whole life and everything I have achieved and dreamt of have been closely linked to throat singing," says D.Khosbayar, one of the most accomplished Mongolian throat singers. The artist became one of the Top 10 contestants of "Germany's Got Talent" (Das Supertalent) show in 2009. The Norwegian National Academy of Arts is launching a project with 32 artists from 12 countries to promote peace and love for the nature through the arts. Within the scope of the project, I will be participating in concerts in Singapore, Malaysia and Australia. I've been living in Mongolia for the past year and have been performing at international festivals and concerts from time to time. I organized two international and one small scale throat singing contest after being appointed as the head of the World Association of Throat Singing. Our association hopes to join Mongolian and Tuvan Associations of Throat Singing together and work under an integrated policy. For instance, we discussed cooperation and the establishment of an integrated policy with the Tuvan Ministry of Culture last year, and in April, we inked a memorandum on cooperation with the Inner Mongolian Association of Throat Singing. The World Association of Throat Singing is going to manage some projects and initiatives of the Ministry of Education, Culture and Science related to artists and culture bearers under a contract. Is it true that you will work with a Chinese company, Starlight Culture Media Co.? Nowadays, the world arts and cultural market is focusing on Asia. Starlight Culture Media previously collaborated with Mongolian Khukh Lake's Khangai and Tuvan Khun Khurtu bands, which have similar traits with our Trans Mongolia band, which will soon hold a tour concert as part of our collaboration with Starlight Culture Media Co. Trans Mongolia will mostly tour around Asian countries, including China, Malaysia, Thailand and India. You have been promoting Mongolian folk art overseas for over 20 years. How do Europeans preserve and protect their culture and heritages? Do they have some kind of national policy? Ulaanbaatar, October 11 (MONTSAME) Nomadic Tourism of Mongolia photographic exhibition opened today at the Mongolian Fine Art Gallery. Co -organized by the Ministry of Environment and Tourism and the Mongolian Tourism Association the exhibition is staged ahead of the International Silk Road Conference on Nomadic Tourism and Sustainable Cities, to be held in Ulaanbaatar on October 13-15. The exhibition is displaying the best 30 photos, handpicked from over 200 excellent photographs taken by tour guides, managers and travelers, representing the unique features of the nomadic lifestyle. The eye catching photos are themed "A morning in the Gobi", "Being a guest to a reindeer herder's home", "Trip on horseback through the country of blue skies", "Camel Festival" and "Road on Drove". The exhibition is to last until the end of October 15 for free of charge.